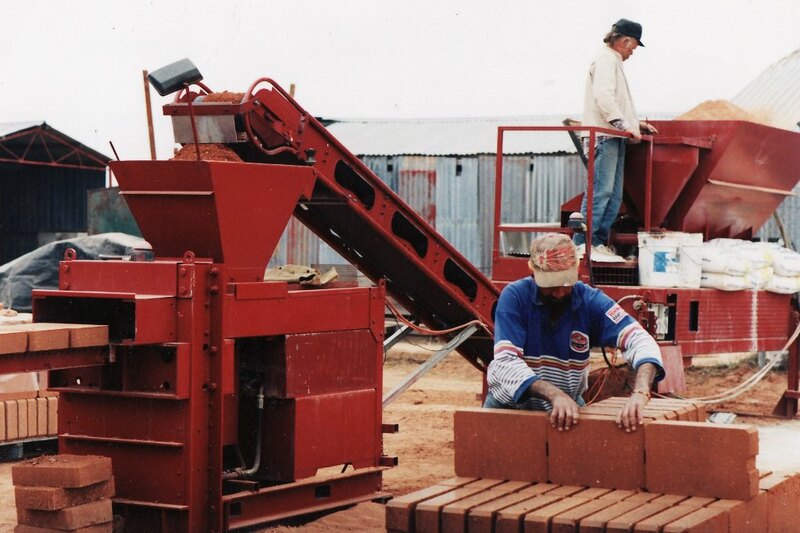 The 'Termite 400' Brick Press is a semi-automated machine which is appropriate for use by communities, contractors and persons requiring medium quantities of Pressed Earth Bricks or Stabilised Earth Bricks suitable for load bearing or infill applications. The plant in its standard configuration will produce up to 400 Pressed Earth Bricks per hour. The standard mould produces bricks that are nominally 385mm X 250mm X 185mm with chamfered corners and a 65mm X 16mm rebate on one end. Two 32mm core holes are an optional extra. This which is suitable for medium production requirements, or communities requiring housing and public buildings. Around 1000 - 1500 bricks per day. For higher requirements, look at the fully automated Termite 400 Series 3. Weight of complete unit is approximately 3000 kgs. Shipping volume is approximately 10 cubic metres. Please contact AMCER for current price and availability.